Tikal National Park is the site of one of the most prominent Mayan cities. Tikal emerged as a notable Mayan city as early as the 4th century B.C. and it was during this time that the construction of the iconic monumental structure at the site began. The city was included among the most powerful Mayan cities during the Classic period of the Mayan civilisation between 200 and 900 A.D. 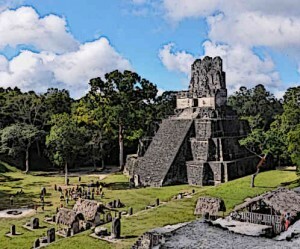 It became the key Mayan power in the Guatemala region and forged powerful alliances with many other cities and peoples. Located at the site of the modern-day Tikal National Park, the site of the city’s ruins today holds one of the most extensive locations of Mayan architecture and archaeology. Tikal is among the few Mayan cities which came into being during the Pre-Classic Period. The region was inhabited as far as the beginning of the 1st millennium B.C., probably earlier as well. Monumental construction in the city had begun by 400 B.C. which means that the city hosted sizable population and a complex society by this time. By the early Classic Period in 200 – 400 A.D., Tikal emerged as the most powerful Mayan city and was often at war with other Mayan powers. Towards the 6th and 7th centuries, Tikal’s decline began as it suffered defeats at the hands of other Mayan cities such as Calakmul. Like many other Mayan cities, it underwent its final and conclusive collapse in the 9th century. The architecture of the city’s ruins, as it is preserved at the Tikal National Park today, is extensive. It comprises of a wide range of architecture such as pyramid temples, palaces, urban plazas and complexes, clusters of religious buildings, causeways connecting different structures within the vast area of the city and more. Among the most notable structures at Tikal are the pyramid temples, many of which rising to extraordinary heights were constructed during the Classic Period and have survived to this day. A very notable feature of Mayan religious buildings is the use of carvings on sapodilla wood, a remarkable architectural feature which has survived to this day. One of the major sites of extant architecture at Tikal’s ruins is the North Acropolis complex. The cluster of architecture found here is one of the richest and most significant of Mayan ruins. Construction at the site of the complex began as early as 350 B.C., with the site serving as the place of royal burials. It kept this use over the subsequent centuries. The death of subsequent rulers and royal personages led to the construction of new pyramids at the site, a trend which continued as late as 9th century. Pyramids commemorating the burials of royal persons in the late Classic Period marked magnificent architecture such as roofcombs, carved presentations of gods on the architecture, hieroglyphics and other ornamental features. The Temple IV is a pyramid-temple located at the Tikal National Park. It is among the tallest structures erected in the Mayan regions during the Classic period of the civilisation. The temple rises to a height of 230 feet and is elaborately constructed. The construction of the temple is dated to the 8th century. Upon the top of the pyramid structure is the small temple and the entrance to this temple is marked by the carved wooden lentils typical of the Tikal Late-Classic architecture. The Plaza of Seven Temples is another notable extant complex at the site of Tikal. As the name suggests, this complex comprises of seven small temples which are erected in a row. The construction of the temples is dated back to the Late Classic period. In the middle of the seven temple structures is a large courtyard. Towards the north of the temple complex are ballcourts. The temples themselves are not very large compared to other temples at the site. The significance of the complex, however, comes from the vast area it covers. According to estimates, the area of the plaza covers some 270,000 square feet. A rather unique part of Mayan architecture are twin-pyramid complexes which are found in different parts of the city. This specific style of constructing pyramids, in pairs and both facing each other, is considered a feature specific to Tikal architecture. In total, nine such pairs have been recovered at the site of Tikal. The temples in these complexes lie in an east-west orientation. Each temple has stairways on all the four sides and are flanked by a stela and an altar. In all, two temples, the stela and the altar form a single complex. The construction of the earliest of the pyramid pairs in this fashion can be dated back to 6th century A.D. Given the vast area that the city of Tikal covered, vast networks of causeways were constructed by the rulers of the city to connect different areas within the city. Most of these causeways were concentrated in the main urban centres of the city. Like the typical Mayan causeways, these were built using limestone and typically facilitated people travelling from one part of the city to another. So far, four major causeways have been recovered at the site of Tikal, with the longest running for 1.3 kilometres. These causeways primarily connecting different temples with urban parts of the city. Tikal National Park is located in the modern-day department of El Peten. It is the site of the Mayan city of Tikal which was one of the most powerful and influential Mayan cities until the Late Classic Period. Tikal became a Mayan urban centre as early as 400 B.C. and prospered until the Classic Period when it came the most powerful Mayan centre in the Guatemala region. It remained the hub of Mayan culture and civilisation all the way until the end of the Classic Period. The National Park today houses extensive remains of the city, such as a vast array of monumental architecture which is still extant. The extant architecture at Tikal has been critically helping in letting archaeologists bring together different aspects of Mayan civilisation.